Ever since Fire, Flour, & Fork was announced, I have been struggling to choose a schedule from the culinary and cultural tracks. With so many great choices, the task of narrowing down each time slot to a single talk became very overwhelming. If you look at my printout of the schedule, there are several check marks all over the place. Finally, I came up with a selection method that I thought would work that would satisfy my desire to learn new stuff and be in line with the goals of the event. Today, we will look to navigate a schedule for Friday October 31st. Relish Fork — I’ve always wanted to learn more about pickling and possibly get into canning so I thought this demo from Paul Virant of Vie would be a great choice. Budino with Bereika — Do you have any idea how much I hate choosing against learning from Tim Bereika?! Pie for Breakfast — Um…I like pie! I like making them and eating them. Maybe Christina Tosi of Momofuku Milk Bar will share her secrets for making Crack Pie. I hear it’s addictive. Chocolate Packing Heat — Yes, I could eat chocolate all day but somehow pies won out. Maybe because my favorite pie is a Kentucky Pecan Pie with chocolate and bourbon. Meat Fork — Jason Alley will teach you how ham is made. Have you had the ham cured ribs at Pasture? Delicious! Professor Pitmaster — I have been working on my barbecue skills but still have a long way to go before I’m ready for competition. Help me Tuffy Stone, you’re my only hope. Rise of Richmond Brewing — Did you really think beer wouldn’t be mentioned here? Mike Gorman will make you love the history behind our growing beer town. Oyster Fork — Did you hear about the Virginia Oyster Trail? Now is the time to fall in love with them. Pickle Fork — Who knew you could pickle things other than cucumbers? David Schulz of Pickled Silly, that’s who. From Farm to Fork — Ok, I might be breaking rule #1 with this one. Nicole Lang is local but Craig Rogers of Border Springs Farm is not. Lamb is also one of my favorite things to cook. Charred Ordinary — Yes, Richmond has a local cidery! Fork Tender — Kendra Bailey Morris will change your perception of the slow cooker. I have used my slow cooker a lot more since buying her book. 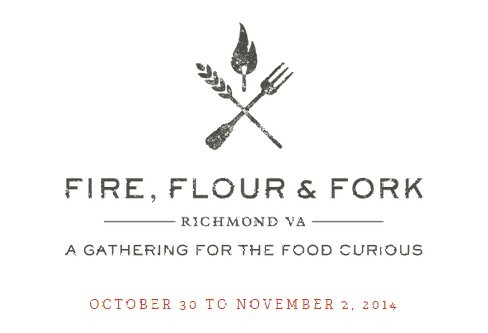 That’s one possible plan for get through Friday’s culinary tracks for Fire, Flour & Fork. Use my plan or make your own rules then pick out a schedule. Tickets are $70 for one-day Friday or Saturday tracks or $130 for both Friday and Saturday tracks. Get your tickets here. Come back later this week to see what I pick for Saturday.